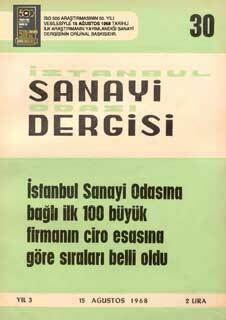 İstanbul Sanayi Odası - ICI Announces "Turkey's Top 500 Industrial Enterprises 2017 Survey"
ICI Announces "Turkey's Top 500 Industrial Enterprises 2017 Survey"
According to the "Turkey's Top 500 Industrial Enterprises 2017" survey of Istanbul Chamber of Industry (ICI) that has been conducted for over a half century and composes the most valuable data of the sector, TÜPRAŞ is the leader with 51.1 billion TL production-based sales in 2017. While Ford Automotive maintains its position in the second place with a production-based sales value of 22.7 billion TL, Toyota Automotive takes the third place with 17.8 billion TL by rising three levels. The production-based sales of ICI 500 witnessed the highest growth of the last 13 years and reached 653 billion TL with 33.2 percent growth. And the export growth of ICI 500 exceeded the total export growth of Turkey with 17 percent increase, and reached up to 64.5 billion dollars. Industrialists continued to spend half of their main operating margins to financing expenses. While the share of the equities in debt regressed, the share of short-term debts increased. 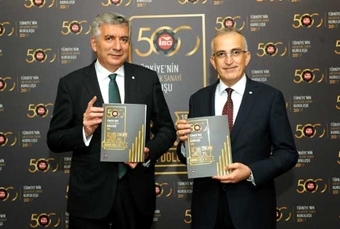 ICI Chairman Erdal Bahçıvan: "ICI 500 research that we are celebrating the 50th year revealed the need to rapidly realize the investment trend and motivation that our industry had entered since the last quarter of the past year. Unless there is a problem in the financial stability, we believe that the contribution of our industry to the national economy will increasingly continue." 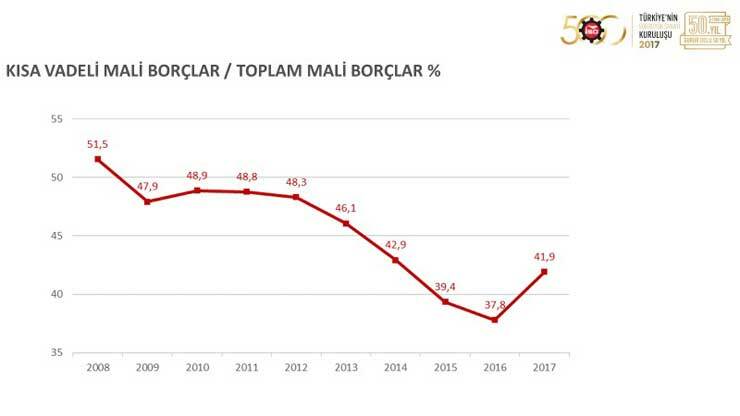 The results of the "Turkey's Top 500 Industrial Enterprises 2017" survey that Istanbul Chamber of Industry (ICI) conducts uninterruptedly since 1968 and composes the most valuable data of the sector are announced. In the press conference conference that was held, ICI Chairman Erdal Bahçıvan announced the results of their survey titled "Turkey's Top 500 Industrial Enterprises 2017" and named TÜPRAŞ as the leader with its production-based sales of 51.1 billion TL. TÜPRAŞ that supplied 6.7 percent of the production-based sales of ICI 500 in 2016 increased this rate to 7.8 percent in 2017. While Ford Automotive maintains its position in the second place with a production-based sales of 22.7 billion TL, Toyota Automotive takes the third place with 17.8 billion TL by rising three levels. According to the survey that is important since it reveals the current state and issues of the real economy, the production-based sales of ICI 500 displayed a high growth performance by increasing 33.2 percent from 490 billion TL to 653 billion TL. The weak growth that had been seen in the production-based sales of ICI 500 in the last three years was replaced by real growth with the 19 percent in 2017. Besides the growth in internal and external demand, the increase in the exchange rates effective in export incomes also played a role in this increase of sales. The achieved growth rate attracted attention as the highest growth of ICI 500 in the last 13 years. 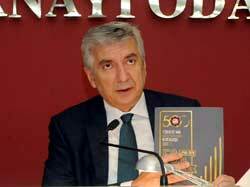 The export of ICI 500 grew 17 percent and reached 64.5 billion dollars. ICI 500 that displayed a performance above the overall export growth of Turkey carried out 41.1 percent of the general export of Turkey and 42.8 percent of the industrial export of Turkey. While the share of the top 10 of ICI 500, which is dominated by the automotive and iron-steel companies, in the overall production-based sales was 25 percent in 2016, this rate increased to 26.7 percent in 2017. "This year's survey made us very proud in two aspects. 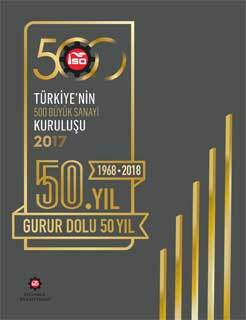 First, we are celebrating the 50th Anniversary of "Turkey's Top 500 Industrial Enterprises" survey of Istanbul Chamber of Industry. We, proudly, announce the results of ICI 500 that had witnessed half a century since 1968 as a rare example not just in Turkey but also in the world. That very first issue, which was published in 1968 and we had reissued for the memory of this day, is inside the folder that we had handed to you. Herewith, I would like to commemorate all, who worked on this historical, priceless source of knowledge to the world of economy by conducting studies and analyses for this tradition that began with 100 companies in 1968 and still continues today. Hereby, I would like to remind you all those that we had lost, especially our Chairman Fazıl Zobu of the time, and express my respect and gratitude towards all, who had made effort for this survey to arrive to these days. And the second aspect that we are proud of is that we had backdated the publication of this valuable research to May for the first time. Remember that we had declared our objective to backdate the release of ICI 500 as much as possible at the beginning of our first term, five years ago. In the past five years, we had first released it on June 16, then within the first week of June and today, we are here to share the results of this survey in May for the first time in its history. We are living in an age of speed where information is very valuable. In this sense, providing this valuable data set to those who need as fast as possible is another source of pride for us. And the greatest factor that enabled us to backdate this release is, no doubt, the companies that shared their carefully and meticulously prepared data on time. Thus, I would like to thank all those industrialists that facilitated our job with their care for this study. Of course, the study is not completed with the delivery of this data. The real tough part starts later. I mean analyzing these data as fast as possible and turning them into the report that you see before you. So, I would like to take this opportunity to congratulate our Economic Studies Division, consultants and all the contributors that completed this challenging process once again this year as all the other and enabled the release of ICI 500. ICI 500 x-rays the industry and reveals how its anatomy had changed within a year. Before starting to talk about some of the main indicators that stand out among these, I think it would be beneficial to briefly talk about the general performance of the industry within the general economy in 2017. In this sense, I would like to start with the growth relationship of Turkish economy and manufacturing industry, and underline the importance of returning to production culture that we keep on mentioning. Turkey had gone through serious challenges within the last two years. These were events that demoralized us both in our economy and political-social life, and that we don't want to remember. Our economy that entered into the year 2017 negatively due to all of these reasons completed the year by achieving one of the brightest growth rates of the world. In fact, when you look at the breakdown of the 7.4 percent growth, you see that the greatest contribution to this growth comes from our industry. While Turkish economy grew 7.4 percent in 2017, the growth in our manufacturing industry was 8.8 percent. This is truly a performance that deserves appreciation. Looking at the factors in this growth, we need to mention the end of economical and commercial recession that had been continued for a long time in 2017. That expansion and export effect in 2017 had been reflected to the performance of the manufacturing industry positively, too. This factor revealed once again that the external markets and the external demand are also very important for our economy and manufacturing industry. Especially the tax deductions, incentives, Credit Guarantee Fund that we, as ICI, was an idea partner of and innovative financial practice such as the "breath loan" that we had contributed once again as ICI also enabled our economy to maintain its dynamism. And then, they had significant contributions in achieving this growth rate. In such challenging days, we had seen and understood what industry and production truly mean. In other words, the year 2017 proved to us that production is an insurance that is essential for a country. This performance of the industry raised the share of the manufacturing industry in national income to 17.5 percent with the current prices. The share of the manufacturing industry in national income displayed a significant value increase with 0.9 point after long years. We had seen the indications of this increase in ICI 2017 PMI data, because this index was at the highest levels of the recent years with a value close to 55 in line with the global PMI data. Thus, we can say that we began to take the first results of the practices focused on increasing the share of the manufacturing industry in GDP within the scope of our return to production economy in 2017. The 17.5 percent achieved today is also promising for the future by being the highest level in the last 16 years. I would like to especially state the following regarding this positive indication: numerous sectors had lost momentum due to various internal and external economic factors recently faced in Turkish economy. But our industry had managed to fulfill its role during these sensitive years of Turkey with the little breath that it inhaled and the tiny support that it received. And for export, for employment, for tax creation, it showed that it is the life ring of the economy. That is why, we, the industrialists, keep on saying that 'we should never compare production, industry with any other sector'. We should never forget that the best friend of a passionate country like Turkey that has ideals and a population of 80 million is the industry in these challenging and tough days. Following this assessment regarding the recent performance of our industry within the general economy, now I would like to move on to the results of ICI 500 with our first table. 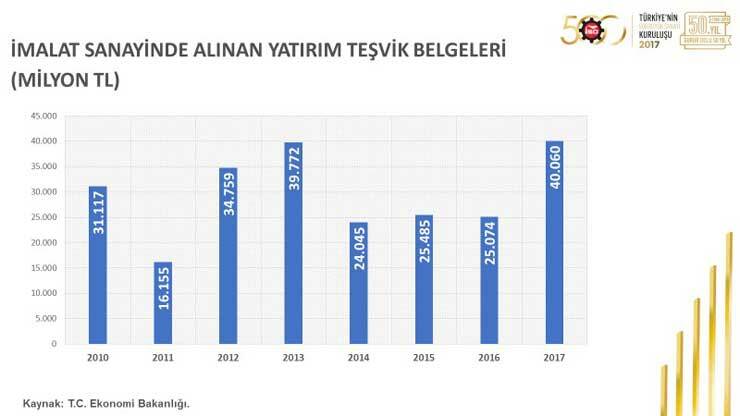 As you can see on this table composed of the most basic indicators of 'Turkey's Top 500 Industrial Enterprises' survey, the production sales of ICI 500 displayed a high growth performance by increasing 33.2 percent from 490 billion TL to 653 billion TL. The weak growth that had been seen in the production sales of ICI 500 in the last three years was replaced by real growth in 2017. The production sales in 2017 grew 19 percent. Besides the growth in internal and external demand, the increase in exchange rates effective in the export incomes also played a role in this increase of sales. The achieved growth rate attracted attention as the highest growth of ICI 500 in the last 13 years. Looking at the distribution of this production-based sales in the top 10 and 50 slices, we see the following picture. While the share of the top 10 of ICI 500 in the overall production-based sales was 25 percent in 2016, this rate increased to 26.7 percent in 2017. And while the total share of the top 50 of ICI 500 in the overall production-based sales was 49.2 percent in 2016, this rate increased to 50.2 percent in 2017. Looking at the share of the second 50 as of production-based sales, we see that the share that was 13.1 in 2016 dropped to 12.9. And we also see a drop in the shares of the other groups of 50 compared to the previous year. The operating profit of the ICI 500 in 2017 is calculated as 9.6 percent. There had been a limited improvement in the operating profit compared to the rate that was 9.4 percent in 2016. And while the total operating profit's absolute size was 52.5 billion TL in 2016, it increased to 70.6 billion TL in 2017.
Financing costs increased from 29 billion TL to 35.2 billion TL in 2017 with an increase of 21.3 percent. Even though the rate of financing costs to net sales dropped from 5.2 percent to 4.8 percent, the industrialists continued to spend half of their revenue from their main operations for expenses. The EBITDA absolute size of ICI 500 in 2017 increased 24.4 percent and reached 94.7 billion TL in 2017. Similarly, the total of profit and loss before tax became 53.1 billion TL with 40.7 percent increase in 2017. The financing costs continued to be the main determinant in the profitability of industrial firms in 2017, too. ICI 500 managed financing costs more effectively in 2017 just like 2016. Industrial firms allocated a smaller portion of their operating profits in 2017 to financing costs. Despite of that, the interest and exchange rate fluctuations within the current financial structure of the industry continued to affect the profitability and capital stock of the industry. Unfortunately we see that the industrialists could not still free themselves from the burden of financing despite of achieving to create more suitable financial conditions in 2017. Our industrialists continued to lose half of their operating profits to financing costs even in this best year within the recent period. Our industrialists, who had to allocate 29 billion TL of 52 billion TL, in other words 55.4 percent of their operating profit to financing costs in 2016, allocated 49.8 percent of their operating profit of 70 billion TL, in other words 35 billion TL to financing costs in 2017. The resource structure that reflects the distribution of equities with debts within the financial indicators is among the top of the indicators that reveal the financial states of the organizations. Especially since the global loan opportunities increased and cheapened significantly in the recent years, the borrowing trend of Turkish private sector companies increased even more. Despite of the rise in exchange rates, the increase in international financing costs and the significant growth in TL interests, the borrowing trend is maintained in 2017 especially due o the expansion of loan opportunities with Credit Guarantee Fund (CGF) assurance. However, equity financing continues to be limited. Among ICI 500, we see that the scale tends to turn towards equities. The share of total debts among ICI 500 rose to 62.9 percent with 1 percent increase and the share of equities dropped to 37.1 percent. Though these leverage rates indicate a similar resource structure with 65/35 band compared to the global examples, the highness of borrowing costs in Turkey affects the competitive power of our industrialists negatively in terms of financing compared to other countries. The financial debts of ICI 500 in 2017 increased 17.1 percent and reached 243 billion TL. Even though this increase slowed down slightly compared to the previous year, the real growth trend had continued. However, another important indicator is seen in the term structure of debts. The share of short term financial debts within the total financial debts entered into regression as of 2008 and the rate that was 51.5 percent in 2008 dropped down to 37.8 percent in 2016. In this period, the industrial organizations used their middle-long term financial debts better and thus, the share of short-term financial debts entered into downward trend. And in 2017, this trend reversed once again. The share of short-term financial debts in total financial debts increased from 37.8 percent to 41.9 percent. While the global average of short term financial debt rate is around 25 percent, this picture reveals the continuance of the negative separation within the financing structure of our industry. We see that the outstanding VAT load of ICI 500 continues this year, too. The outstanding VAT load on the industrialists increased at a significant rate such as 20 percent compared to the previous year, and reached 7.2 billion TL. We have to say that the industrialists that is in such a difficult position since they can obtain financial resources only with high costs loan such a significant amount to the state with zero interest. This picture shows us the state that our industrialist is in in terms of investment appetite and motivation. The fact that the share of circulating assets within the total assets is high is positive in terms of operating capital management. However, the regression in the share of fixed assets shows us that the fixed asset investments, in other words production machinery and equipment investments weakened. The fixed assets of ICI 500 increased up to 46.3 percent in 2015, and then decreased back to 45.3 percent in 2016 and 41.5 percent in 2017. Despite of the relative improvement in the investment conditions and significant investment incentives provided in 2017, the fixed asset investments failed to display a sufficient growth. As ICI, we observe that the dynamism in both internal and external demand increased up to 80 percent as of the second half of 2017, and state that the new investment need is at the maximum level. In other words, we underline that this success that the industrialists achieved today needs to turn into investment with the new support provided by the production economy both in terms of production capacity and technology. However the financial turbulence and the uncertainty that we are currently in cause our industry to spin while fulfilling this need. In other words, the things that need to be done in this period that the investment motivation is maximized are to create the right financing resources and to differentiate the incentives. Looking at the number of organizations profiting or losing, we see that the relative stability of financial indicators and the significant increase of sales in 2017 affect the profitability performance of the firms positively. In 2017, the number of organizations profiting among ICI 500 increased from 392 to 422. And the number of firms that profit or lose before interest, amortization and tax increased to 488 in 2017 and reached the highest value of the last five years that it is being measured. We would like to make assessments regarding technology through this picture that we have shared recently. As we had defended and stated at every occasion that our industry can only provide more momentum to the economy through high added value, technological products by focusing on technology more. These data that we had been sharing with you indicates that our industry is still far away from this vision. As in the last two years, the highest share in terms of the created added value in 2017 belongs to medium-low technology-intense industries with 39.9 percent. The share of low technology-intense industries decreased 1.2 points and became 36.2 percent. And the share of the medium-high technology-intense industries increased from 19.5 percent to 20.2 percent. The share of high technology-intense industries stayed almost at the same level as the previous year with 3.6 percent. Improving R&D expenses and benefiting from the respective incentives are among the most important opportunities of Turkish economy. In ICI 500, the number of firms engaged in R&D increased from 239 to 254. However, the research and development activities in our industries are not yet sufficient and at the required level despite of this picture. R&D expenses of ICI 500 increased 23.7 percent and reached 3.5 billion TL as 0.53 percentage of production-based sales below global average. We believe that the increase of R&D expenses will be the most important motivation for the advanced-technology and high added-value development of Turkish industry. And now, I would like to talk about the employment data, one of the most important indicators of ICI 500. The employment provided by CI 500 increased 1.7 percent in 2017. And the increase in paid wages and salaries is 14.1 percent. Compared to inflation, it is seen that the wages and the salaries had increased in real terms. In 2017, the number of foreign capital organizations among ICI 500 decreased 8 and became 115. Despite of the decrease in the number of foreign-capital companies, the export weight of these firms is pleasing. While these 115 firms carry out 48.4 percent of the total export of ICI 500, they also perform 32 percent of production sales. Now, it is time to announce the giants of the industry. You can see the full list on our magazine. As each year, I would like to first share the top 10 firms of ICI 500. The largest organization of ICI 500 in 2017 is once again Tüpraş with 51.1 billion TL production-based sales. Ford Automotive maintained its second place with 22.7 billion TL production-based sales. And the third place went to Toyota Automotive that was ranked sixth in 2016 with 17.8 billion TL production-based sales. 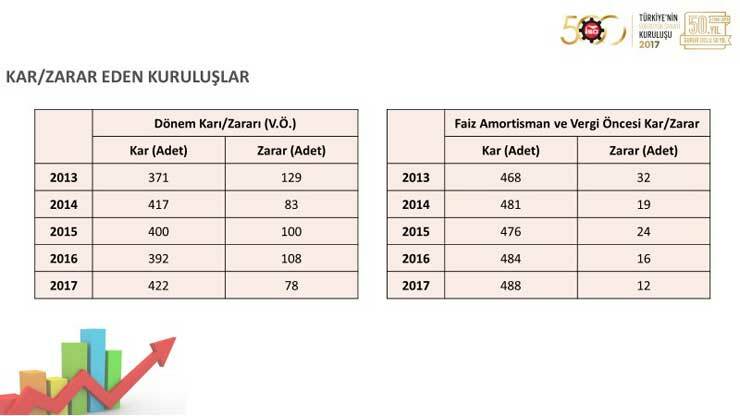 Tofaş took the fourth place with 15.9 billion TL, Oyak-Renault took the fifth place with 15.7 billion TL and Arçelik took the sixth place with 12.6 billion TL. While Iskenderun Demir Çelik rose three steps to seventh place with 10.6 billion TL, Ereğli Demir Çelik that was not among the top 10 in 2016 became eight with 9.9 billion TL. 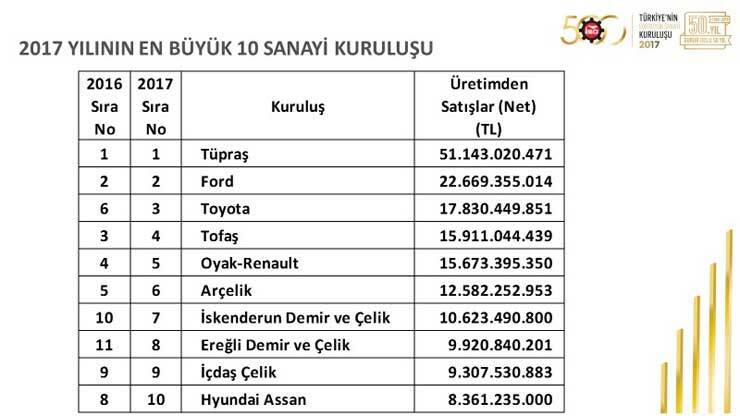 Ninth place goes to Içdaş Çelik with 9.3 billion TL and tenth place goes to Hyundai Assan with 8.4 billion TL. The export performance of ICI 500 increased significantly in 2017 after the recovery in 2016. 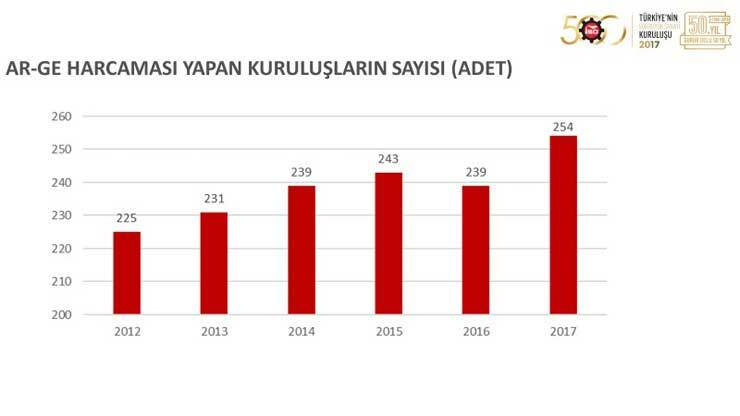 While the total export of Turkey increased 10.2 percent and the Turkish industrial goods export increased 10.6 percent in 2017, the export of ICI 500 grew 17 percent and became 64.5 billion dollars. 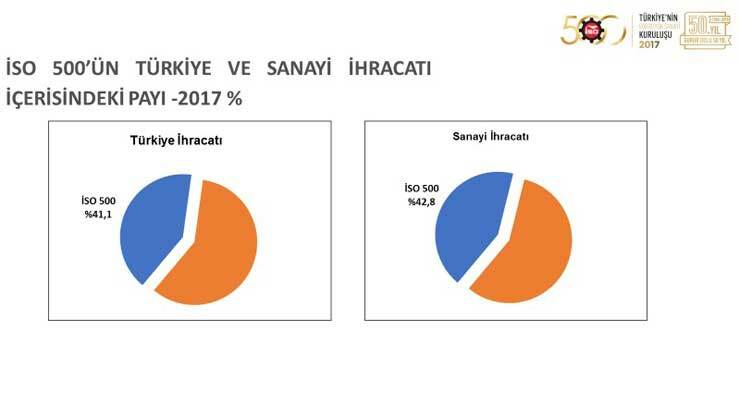 The export increase in ICI 500 displayed a performance higher than the export increase in Turkey. With this performance, ICI 500 managed to provide 41.1 percent of the general export of Turkey and 42.8 percent of the industrial export of Turkey. 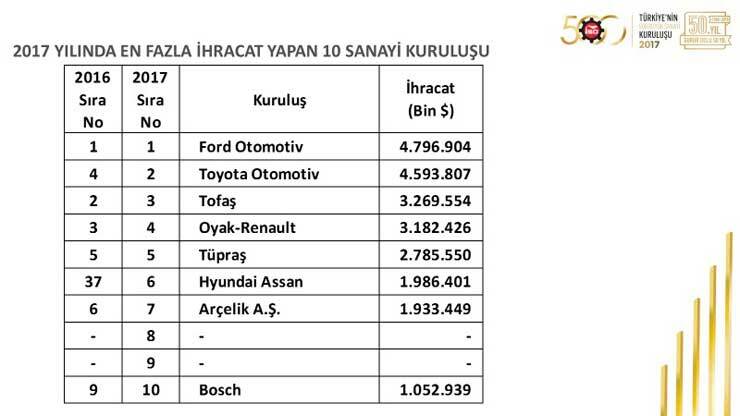 The top three organizations in 2017 export had been Ford Automotive with 4.8 billion dollars, Toyota Automotive with 4.6 billion dollars and Tofaş with 3.3 billion dollars. 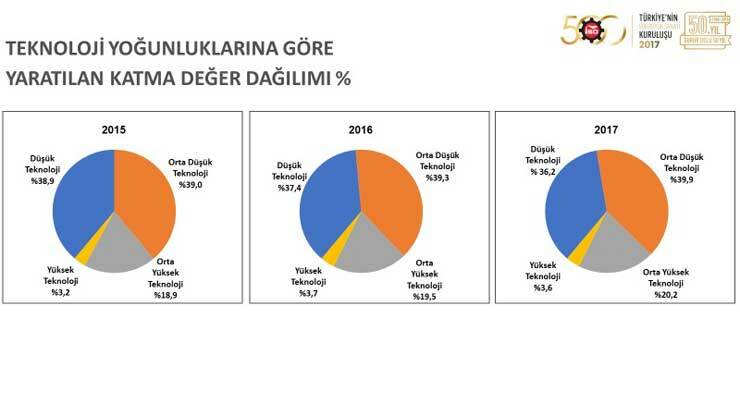 As in Turkish export, automotive industry maintained its pioneer position among ICI 500 in 2017 as in 2016, and stood out especially with its performance in export. We believe that this valuable survey will once again provide significant insights to the Turkish managers, opinion leaders and we, the industrialists. The most important one is the need to rapidly realize the investment tendency and motivation that our industry had entered since the last quarter of the past year. And we can see this strong will and desire at the investment point also in the increase of investment incentive documents issued in 2017. The optimization of capacity use with the impact of external demand vitality in 2017, the growth in the industry, the strong indication of ICI PMI show us that a new technological and capacity increasing investment period had arrived as I mentioned before. The whole issue here is the skill to realize this investment climate in Turkey. Even though we maintain our hope regarding these investments, we are sorry to see that we are late in this. However, we are aware that we need to rapidly reinforce the current cycle with investments. We believe that the Credit Guarantee Fund, which brought a great dynamism to the economy and contributed to the growth, will be revised in the following days and turn into a new lifeline that we need for quality industry investments. While our economy had entered into a production-oriented climate, the great investment incentive movement initiated by our President Mr. Recep Tayyip Erdoğan two months ago had been an important step supporting our industry and production economy. The most important factor that makes these incentives valuable for our industrialists is for them to be an incentive package that is fully focused on industry for the first time in Turkey. These projects at the investment phase will create a downward significant employment and job opportunities like a pyramid, establish their own side industries and enable their development. We believe that the preference of local supplies in machinery investments will also contribute to the development of our machinery and equipment industry. When this motivation of our industry to invest, produce and employ is supported with the right financing conditions, I have no doubt that our economy will enter into a much stronger growth trend. Once structural subjects such as Development Banking and Credit Guarantee Fund pioneered by ICI began to be discussed, we will continue to witness quality growth with our industrialists that will be financially relieved. This picture that we had shared with you today is an indication of our trust in Turkey, as industrialists. In this sense, I would like to once again underline the importance of financial stability for sustainable, stable and quality growth as we did at every opportunity. If we do not face any issue regarding financial stability that will be the main determinant in carrying the promising growth in 2017 to the future, we believe that the contributions of our industry to Turkish economy will increasingly continue. While ending my speech here, I would like to thank you, our valuable press members for attending this conference and express my respect and love for all of you.